This open letter was written by six, leading tornado experts from research institutions across the United States. Their brief bios follow below. The authors contributed this article to LiveScience's Expert Voices: Op-Ed & Insights. Twisters returned to the national spotlight after a Nov. 17 outbreak viciously tore through 12 states, leaving eight people dead. Research data show that climate change caused by human behavior is fueling more frequent and intense weather, such as extreme precipitation and heat waves — so it's only natural to wonder if this applies to tornadoes, too. Scientists need more data and time to fully address that connection. For instance, University of California, Berkeley, professor Richard Muller argued in a recent New York Times opinion piece that "the scientific evidence shows that strong to violent tornadoes have actually been decreasing for the past 58 years, and it is possible that the explanation lies with global warming." The honest "truth" is that no one knows what effect global warming is having on tornado intensity. 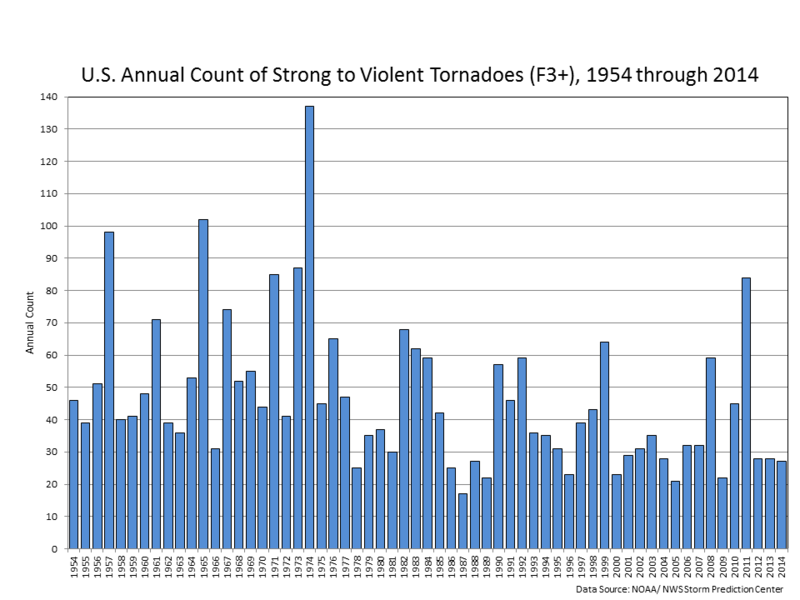 Tornado records are not accurate enough to tell whether tornado intensity has changed over time. Although it is a bit of an exaggeration to say, "backyard dust devils are reported," Muller notes — correctly— that climate change is not responsible for the dramatic rise in annual tornadoes since 1950. Rather, the larger numbers come from improved detection and reporting of weak tornadoes, particularly EF0 tornadoes, where "EF" refers to the enhanced-Fujita scale used by the National Weather Service (NWS). However, Muller then uses the record of severe tornadoes — those rated EF3 to EF5 and responsible for the most extreme damage and casualties — to reach the following conclusion: "One thing is clear … The number of severe tornadoes has gone down. That is not a scientific hypothesis, but a scientific conclusion based on observation. Regardless of the limitations of climate theory, we can take some comfort in that fact." His confident claim is based on raw U.S. National Oceanic and Atmospheric Administration (NOAA) records showing an apparent decline in EF3 to EF5 tornado reports in the past 58 years. Unfortunately, it illustrates a lack of understanding of how those reports have been developed, and the changes in the process over time. Scientific conclusions must be based on reliable observations, not just any observations. Ironically, the reason Muller says one shouldn't attribute the increase in weak (and therefore total) tornado reports to climate change is likely the same reason the intensity of tornadoes has appeared to decline: reporting has not been consistent over the period the tornado records span. The meteorological community knows very well that early official records systematically rated tornadoes stronger than those in the 1980s and 1990s — that is, tornadoes were awarded higher EF-ratings in those decades than they would have received in more recent times. Tornadoes occurring prior to the mid-1970s — when the NWS adopted the enhanced Fujita scale — received ratings retrospectively by meteorology students who relied on qualitative damage descriptions in newspaper archives. This effectively "inflated the grades" of those tornadoes because the later ratings came only after considerable in-person scrutiny of the damage, often by engineers who considered not just the damage but also the quality of the construction of damaged structures. The evidence for the overrating of earlier tornadoes includes the fact that environments and damage paths of many strong tornadoes in that retrospective era shared characteristics with weaker tornadoes from later years. Considerable evidence uncovered in the last decade suggests that previous tornadoes actually were underrated compared to the 1980s and 1990s. One factor contributing to those ratings was a 2003 policy that required a special team of experts to evaluate the damage of the strongest tornadoes. In an unforeseen consequence, local NWS offices had a tendency to assign lower initial ratings, eliminating the expense and complexity of involving external evaluators. In addition, concerns about construction practices from the engineering community placed additional emphasis on poor construction by damage assessors from the NWS, leading to lower ratings. Also, in another complication in assessing long-term tornado intensity trends, the "damage indicators" used to rate tornadoes recently have changed with the adoption of the EF scale, making it dubious to compare tornadoes of the past with those of the present. Recently, truck-borne Doppler radar observations of tornadoes identified a number of cases in which the radar-measured winds are considerably faster than the official NWS rating implies. For example, the winds measured by these radars in last May's 2.6-mile-wide tornado near El Reno, Okla., topped 280 mph, which would have placed it well into the EF5 range (200+ mph). The official NWS rating based on the available damage indicators, however, was EF3 (136–165 mph). Finally, Muller's simple analysis of tornado reports does not address possible changes in the seasonality and/or regional nature of tornado occurrence. In fact, the latest climate-model experiments agree that further global warming is likely to increase the likelihood of conditions favorable to the severe thunderstorms that produce tornadoes in the spring and autumn. Although these climate models do not resolve tornadoes, they do predict an increase in the ingredients responsible for past tornadoes. Paul Markowski, professor of meteorology at Penn State University, was a leader of the recent Second Verification of the Origins of Rotation in Tornadoes Experiment (VORTEX2) and 2013 recipient of the National Weather Association's Fujita Award for his research on tornado formation. Harold Brooks is a senior research scientist at NOAA's National Severe Storms Laboratory, has authored numerous scientific papers on tornado climatology, and was a contributing author on the recent Intergovernmental Panel on Climate Change's Fifth Assessment Report. Yvette Richardson, associate professor of meteorology at Penn State University, is a Councilor of the American Meteorological Society and was a leader of the recent Verification of the Origins of Rotation in Tornadoes Experiment (VORTEX2). Robert J. Trapp, professor of atmospheric science at Purdue University, has published several articles on the topic of severe thunderstorms and climate change. John Allen, postdoctoral research scientist at the International Research Institute for Climate and Society at Columbia University, has authored several recent journal articles on relationships between the climate system and severe thunderstorms. Noah Diffenbaugh is an associate professor in the School of Earth Sciences and the Woods Institute for the Environment at Stanford University. He is currently a Lead Author for the Intergovernmental Panel on Climate Change. The views expressed are those of the author sand do not necessarily reflect the views of the publisher. This article was originally published on LiveScience.